Vitamin D is a fat-soluble pro-vitamin compound that’s actually considered more of a hormone than an actual vitamin. Research has connected low levels of Vitamin D with nearly all types of disease and shown that healthy levels equate to a healthier life. Vitamin D deficiency is thought to play a role in countless health conditions such as heart disease, osteoporosis, metabolic syndrome, and chronic fatigue syndrome (R). Modern research has also shown that maintaining healthy levels of Vitamin D can help drastically reduce the risk of all types of cancer—although skin cancer remains a risk of prolonged sun exposure (R). Understanding the benefits of this novel compound can help better illustrate a path to a healthy and well-balanced life. Vitamin D covers a class of several compounds in your body that are actually considered prohormones rather than vitamins. The most common form of Vitamin D is D3 which is prohormone compound called Cholecalciferol and is converted by your kidney’s into 25-hydroxyvitamin D [25(OH)D] (R). Vitamin D3 starts its journey in our bodies by being converted to Cholecalciferol from Dehydrocholesterol by the radiant energy of the sun. It’s also worth noting that artificial sources of infrared light, such as infrared saunas, have also demonstrated the ability to help our bodies make Vitamin D (R). Dehydrocholesterol is then converted to Calcifediol by the liver which is then converted to Calcitriol. Each of these compounds serves novel roles in the human body but calcitriol is often considered the most beneficial. Calcitriol helps your digestive tract to better absorb vital nutrients such as magnesium, calcium, and zinc. Also of note is that researchers found the people given Vitamin D2 supplements showed a 40% decrease in overall Vitamin D3 levels. For this reason, Vitamin D3 is regarded as the superior to Vitamin D2—and the most-recommended form of the two by many health professionals. People with darker skin tones are more susceptible to Vitamin D deficiency because they absorb less energy from the sun. Good news is fewer sunburns; bad news is lower Vitamin D levels. Natural sunlight helps provide your body a means to produce Vitamin D but won’t increase levels alone. That’s to say, sunlight doesn’t actually carry any vitamin D in it! Rather, sunlight serves as a catalyst to convert 7-dehydrocholesterol into more useful compounds such as 25-Dehydrocholesterol. It’s kind of like providing electricity to a saw: one needs electricity for the saw to work but even when it’s plugged in you won’t get anything accomplished without woo to cut. In this case, compounds like 7-dehydrocholesterol are like the wood, the sun is like the electricity, our bodies are the saw, and Vitamin D are the boards that help make our homes stronger and more resilient. It’s important to note that people with darker skin pigmentation are at higher risk of Vitamin D deficiency. This includes genetically-darker pigmentation as well as darker pigmentation aquired through environmental conditioning such as tanning or sunburns (R). The harder it is for sunlight to be absorbed the less effective our bodies are going to be at synthesizing Vitamin D.
Vitamin D plays a vital role in helping to maintain many aspects our health and wellbeing. One such role is Vitamin D’s assistance in maintaining Calcium Homeostasis. This helps ensure strong bones and healthy muscles, among other things. Vitamin D has many other benefits as well though. Research has shown that low levels of Vitamin D are associated with a significantly higher risk for all types of disease (R). This is referred to as “all-cause mortality” and is kind of a big deal when it comes to illustrating the importance of Vitamin D. To get a better idea of just how important Vitamin D is to our health, let’s take a look at some of its specific benefits. Vitamin D has been shown to reduce the risk of nearly all types of cancer as well as exhibiting the ability to prevent damage from conventional cancer treatments. Research has shown that maintaining a serum Vitamin D level of 40 ng/ml or greater reduces the risk of cancer by 67% (R). That’s an astounding revelation. The exception, in this case, would be skin cancer. Spending time in the sun will surely help to increase one’s Vitamin D levels but will also put one at higher risk for skin cancer. This kind of issue can be easily avoided by combining healthy amounts of sun exposure with Vitamin D supplementation. Vitamin D helps calcium get absorbed throughout the body. Among many uses for calcium, our body uses it to help regulate muscular contraction (along with magnesium) and can help ensure strong bones as well. Vitamin D is beneficial at every stage of our lives but plays an especially important role once we get older. Research suggests that maintaining healthy levels of Vitamin D in the later stages of our lives can significantly lower the risk of conditions related to lowered bone density and mass such as osteoarthritis and osteoporosis (R). Vitamin D levels have been connected to intestinal absorption of calcium as well. In addition to strengthening bones and muscles, calcium it utilized in many other places throughout our bodies on the cellular level (R). Another important compound in this equation is Vitamin K2, which is produced from microflora in the digestive tract. Vitamin K2 helps prevent the calcification of tissues but also helps transport calcium to where it needs to be in our bodies (R). 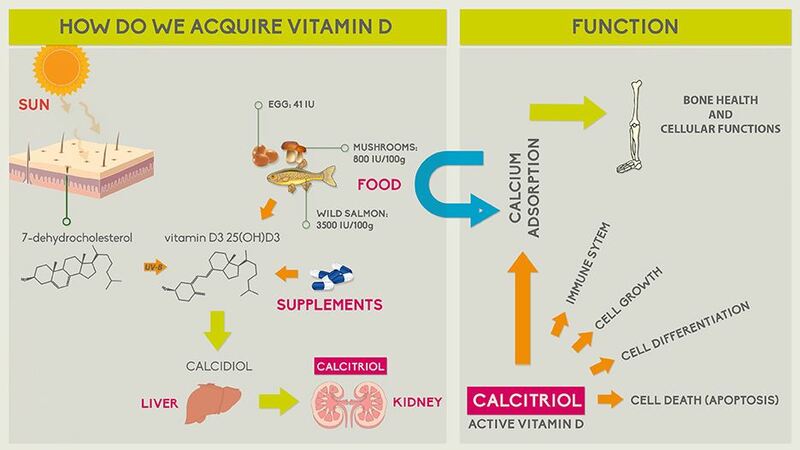 For this reason, Vitamin D, Vitamin K, and Calcium are often regarded as co-dependent on one another and commonly paired in dietary supplements. Nutrients such as Vitamin D have recommended levels established in an attempt to improve public health. These levels are referred to in several different ways, depending on the available data. One such term used for reference is the Daily Reference Intakes (DRI). This term is used to describe the Adequate Intake (AI), Estimated Average Requirement (EAR), and the Recommended Dietary Allowance (RDA) for certain compounds. Depending on the amount and confidence of available data, these levels may or may not be available for any single nutrient. The EAR is a value used to estimate the nutrient intake that’s estimated to meet the nutritional needs for a certain compound for half of all people. RDA is used to estimate the level required by a nutrient to meet 97% of all people’s nutritional requirements. When enough data to establish an RDA isn’t available, the AI estimate is used. This is common among younger age groups, such as infants, where age-specific data is often lacking. After all, there are many fewer studies conducted on infants than adults. Below, you’ll find a table of the DRIs for Vitamin D.
The DRI for Vitamin D was established in 1997 and is currently available in the 2011 edition of the Dietary Reference Intakes for Calcium and Vitamin D (R). This is the de facto authority on most all nutritive considerations for Vitamin D but, at least in recent years, has come under criticism. The current data reflects that 600IU of Vitamin D supplementation will achieve a serum level of 50mmol/L in 97.5% of healthy individuals. The re-evaluated data suggests that 600IU would only maintain a serum level of 26.8mmol/L Vitamin D and that 8895IU of Vitamin D would be needed to assure that 97.5% of healthy individuals have a serum level of 50mmol/L or more. In other words, this analysis suggests that the current RDA for Vitamin D may be almost 14 times lower than what is actually needed (1382.5%). This is a startling revelation and suggests that the current RDA might fall woefully short in its goal of helping to ensure adequate Vitamin D levels. The surest way to determine if you’re getting enough vitamin D is to have your doctor test your serum 25(OH)D levels. If you’re deficient start taking a Vitamin D supplement until you’re not. Regular testing can help narrow down the daily dose needed to help maintain an adequate level. Testing is key to understanding your nutritional dynamics. Healthy levels of Vitamin D, at least taken from research suggesting significant impacts on disease risk reduction, are anywhere from 40-60 mmol/L. With the thought that current RDA values might be woefully inadequate, one might consider upping their daily Vitamin D dose considerably. Before doing such, it’s important to consider that there is an upper limit for Vitamin D at which point toxicity can occur. The following table illustrates common diagnostic thresholds for Vitamin D deficiency, sufficiency, and toxicity. If nothing else, it can be said that there are a lot of differing opinions on how much Vitamin D is enough, and how much is too much. 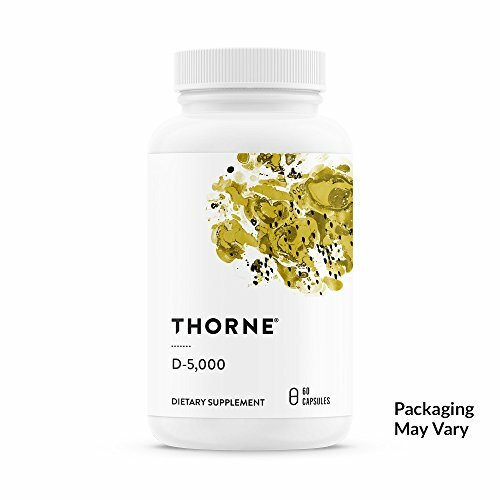 One study concluded that daily doses of 10,000IU may be required to maintain sufficient levels and that no harmful side effects have been noted in doses of up to 40,000IU (R). Again, the best approach is to have your doctor test your serum 25(OH)D levels and adjust your supplementation amounts until you reach the desired level. 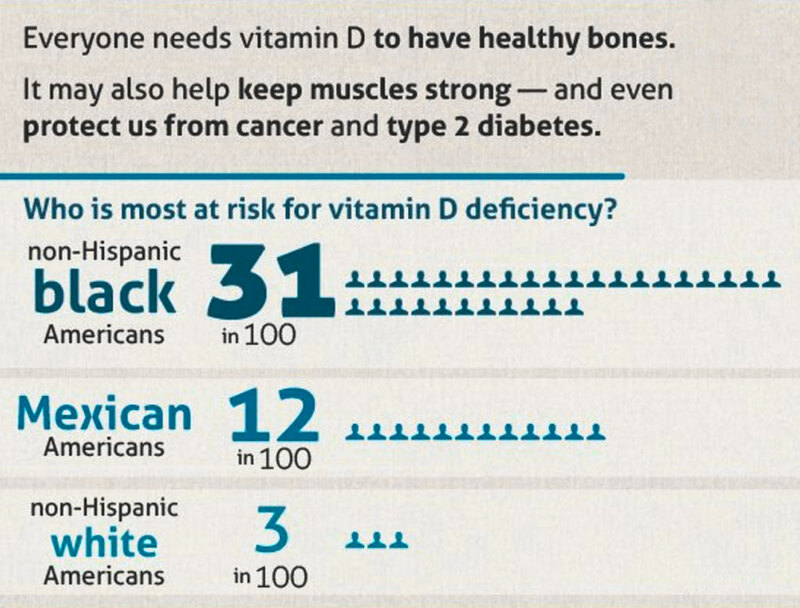 Recent research estimates nearly 250 million Americans may suffer from a Vitamin D deficiency (R). This hardly comes as a surprise with the recognition that current RDA recommendations may fall far below sufficiency. There is a large variance in the reported data in newer scientific studies related to Vitamin D supplementation and maintaining adequate serum 25(OH)D levels. These studies, taken as a collective, imply that there is a very little consensus among the Scientific community with regards to how much vitamin d is enough and how much is too much. The strong correlation between risk of disease and insufficient Vitamin D levels should make Vitamin D a high nutritional priority. Testing is inexpensive, available at nearly every medical facility that offers common blood testing, and the only way to determine an individual’s need for additional dietary Vitamin D, either through supplements or dietary adjustment. Vitamin D levels connection to reduced Cancer risk is also an incredible revelation. Other than skin cancer, Vitamin D is now understood to be essential in the reduction of cancer risk. Modern technologies such as infrared saunas offer a novel way to increase the synthesization of Vitamin D without necessitating additional exposure to UV radiation. Unfortunately, these devices are cost-prohibitive in some cases. Vitamin D seems to have the potential to impact nearly every aspect of our health. Ensuring adequate Vitamin D levels throughout life seems, given the current data, to be the easiest way to lower risk of nearly every major disease. Only individual testing will allow one to know their unique needs but it’s safe to say that, given the prevalence of Vitamin D deficiency, just about everyone could stand to have a little more Vitamin D.
We work hard to provide useful content to help better unravel the mysteries of health. If you enjoyed this article please let us know by using the rating box below.